What began in 1995 as a one-man lawn maintenance company founded by Cody Duplessis has grown into a full service commercial and residential lawn and landscape company. 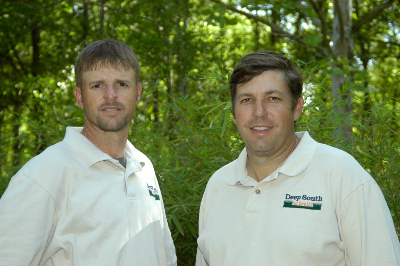 With Chris Duplessis joining the company in 2000, Deep South Turf Care began providing landscape design and installation. Today, Deep South Turf Care offers full service lawn maintenance with annual contracts available from basic lawn maintenance to packages that include complete landscape maintenance and fertilization. Other services offered include landscape design, installation, and maintenance, as well as irrigation, drainage, lighting, and hardscaping. It has taken many years of experience and passion to achieve our level of service. If you are ready to find company that is committed to long-term service and to make your property look its best, Contact Us.